PERRY TWP. With his team down two touchdowns faster than you can say “Enter Sandman,” Hoover coach Brian Baum stood in front of his players and delivered a message that stung harder than anything his defense had thrown at Perry through the first eight minutes. 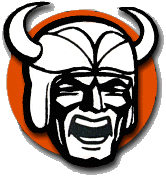 For the final 40 minutes, the Vikings did, out-Perrying the Panthers up front en route to a decisive 35-21 victory that put Hoover back in the Federal League championship race. Perry’s intro song may feature the words “Exit light, enter night,” but it was the Vikings who played lights-out when it mattered the most. While Hoover’s defense shut down Perry’s vaunted wing-T over the final three quarters, sophomore quarterback Connor Ashby was masterful all night, completing 23 of 26 passes for 259 yards and two touchdowns. He also ran 12 times for 80 yards and a touchdown for the Vikings (4-2, 2-1), who are one game behind McKinley in the league standings. David Forrest caught six passes for 113 yards, including a 50-yard bomb over the Perry defense in the opening minutes of the third quarter that gave Hoover the lead for good, 21-14. Junior RB Adam Griguolo added 100 yards on 24 carries with two touchdowns, capping a 35-0 run by the Vikings. Although Perry’s offense finished with 311 yards rushing, 158 of those yards came on the game’s first two drives. (Another 74 came on a fourth-quarter touchdown run by Josh Lemon that finished out the scoring.) Hoover’s defensive line repeatedly shifted to counter Perry’s formations and the Vikings’ linebackers and defensive backs played fast and physical. Consequently, they were able to do something only one other team has done over the past four seasons — beat Perry in the second half of the regular season. Perry senior RB Jarin Curtis carried 13 times for 115 yards for Perry (5-1, 1-1), which was playing without senior RB Richard Curtis (shoulder). The Panthers also lost starting QB-S Frank Sciury to a sprained ankle injury late in the game, sapping their already thin roster. “We don’t have enough dudes,” said Panthers coach Keith Wakefield, whose only other loss between Weeks 6-10 over the last four years was to Lake in 2015. Lemon carried nine times for 160 yards and Sha’VeA Lightner had 47 yards on eight carries. Although Perry’s offense struggled for much of the game, Wakefield was more concerned about his defense, which looked overmatched in the second and third quarters and gassed in the fourth. “We couldn’t tackle anybody tonight,” he said. “We didn’t tackle the back (Griguolo) very well and we didn’t tackle (Ashby) at all. We are so unathletic and that’s obvious. They ran over some of our guys, and their receivers are really good blockers. They were getting 5 to 7 yards before anyone touched them on some of their plays outside. The Panthers have a manageable schedule ahead — of their final four opponents, only McKinley has a winning record — so a playoff berth is very much in play, as is a Federal League title provided they win out. As for the Vikings, more than a few players mentioned the “p” word afterward, something they haven’t seen since 2012.